When the Washington Redskins lost Derrius Guice for the season, head coach Jay Gruden wasn’t too concerned. Last season’s running back room wasn’t too bad, and he still had all of them—until he didn’t. Samaje Perine will return this season, unlike Guice, but he is injured as is Chris Thompson and Byron Marshall. Suddenly, the Redskins needed to add someone so that they’d have enough bodies to finish the preseason. So, they did, but they didn’t add just any old running back off the street. They picked up Adrian Peterson. He wasn’t impressive during his brief stint with the Saints last year. But for the Cardinals, he did have a pair of 100-yard days. He also had three 20-yard days. But at this point in the season giving him a shot is a low-risk, high-reward scenario. If he plays well– that’s fantastic. If he doesn’t, you cut him and forget he was ever on the roster. 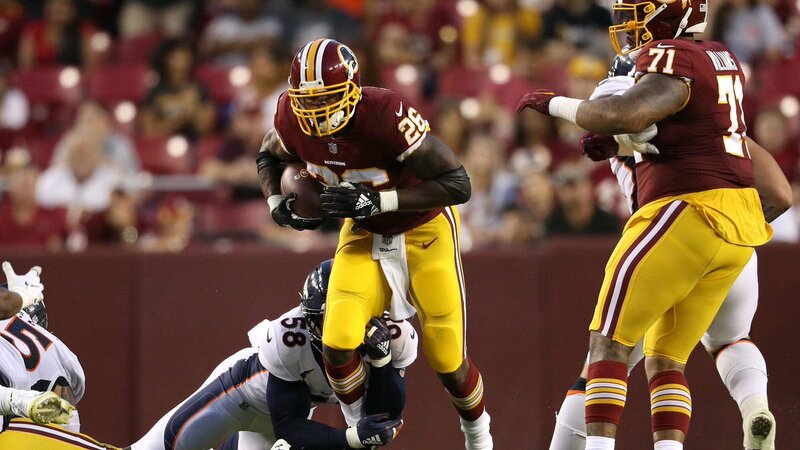 Washington fans could get used to seeing AP in a Redskins jersey if he continues to run like he did Friday night. He didn’t always have big holes or lanes to run through. But he made the most with what the O-line gave him (11 carries for 56 yards). Gruden may have a hard time justifying making Rob Kelley the start after Peterson runs well and Kelley doesn’t (eight carries for 19 yards. You can give the Broncos offense credit for playing well or say the Washington defense did not look good—because they didn’t. That defensive front that seemed so strong last week allowed the Denver running backs to average five yards a carry and score twice. You can’t win too many games doing that. Case Keenum finally looked like the guy the Broncos were hoping to get when they picked him up (12-18 for 148 yards). He appeared to be much more in sync with his receivers this week (something that’s been missing the last couple). Emmanuel Sanders looked good making four catches for 61 yards and a 27-yard run for a touchdown. He’ll need to continue looking good not to lose snaps to rookie Courtland Sutton (three receptions for 45 yards). “As far as what we showcased tonight after this game, I would say, yeah, we’re ready to go out and play against anybody, and we can win, we can compete,” Sanders said after the game. Denver’s defensive front did a great job of putting pressure on Alex Smith (3-8 for 33 yards) and Colt McCoy (3-8 for 19 yards). Kevin Hogan (7-9 for 88 yards and two touchdowns) led the Redskins to a pair of touchdowns because the guys that are going to make the roster were already out of the game. It could be a running back by committee approach for the Broncos this year. Royce Freeman looked fantastic on his 24-yard touchdown run but otherwise gained two yards on four carries. Phillip Lindsay could carve out a roll (five carries for 31 yards; one reception for 18 yards). Don’t sleep on Chad Kelly (7-11 for 70 yards). If the Broncos start to lose and Keenum struggles or gets hurt, he could surprise everyone. Sorry, Paxton Lynch but your time is short in Denver (3-7 for 39 yards). For those that kep score in the preseason, the Broncos won 29-17. The Broncos wrap up the preseason next week against the Arizona Cardinals. Washington will close out the preseason against the Baltimore Ravens.